William Morris was the first author of fantasy literature to use a completely invented setting for his novels. He was an important influence on J.R.R. Tolkien and C.S. Lewis. The copyrights on William Morris’s work have expired, so they are available for free download (some in audio format) at public domain sites such as Project Gutenberg. 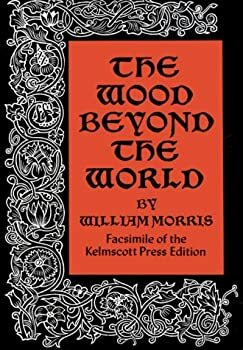 I read The Wood Beyond the World largely because I enjoyed the author's The Well at the World's End so much. I was disappointed in it, though. It doesn't have the depth of the slightly later book (they were published two years apart), and the story itself is not as satisfying, nor is the main character as strong. Notes: Because the copyright has expired, you can get The Well at the World's End for free on the Kindle at Amazon or at Project Gutenberg. Make sure you have the entire book. Some publishers have divided it into two installments. The Story of the Glittering Plain — (1891) Publisher: It has been told that there was once a young man of free kindred and whose name was Hallblithe: he was fair, strong, and not untried in battle; he was of the House of the Raven of old time. “Drink, O black-fledged nestling! But call a health over the cup if thou wilt.” So Hallblithe raised the cup aloft and cried: “Health to the House of the Raven and to them that love it! an ill day to its foemen!” Then he set his lips to the cup and drank; and that wine seemed to him better and stronger than any he had ever tasted. But when he had given the cup back again to Fox, that red one filled it again, and cried over it. Child Christopher and Goldilind the Fair — (1895) Publisher: Child Christopher and Goldilind the Fair is both fairy tale and prose romance, as freshly-written today as it was the day William Morris created it. It tells the tale that in the country which lay south of Oakenrealm, and was called Meadham, there was in these days a king whose wife was dead, but had left him a fair daughter, who was born some four years after King Christopher. A good man was this King Roland, mild, bounteous, and no regarder of persons in his justice; and well-beloved he was of his folk: yet could not their love keep him alive. The Water of the Wondrous Isles — (1897) Publisher: Hah, thrall! said the lady, thou art bold; thou art over-bold, thou naked wretch, to bandy words with me. What heed I thy tale now thou art under my hand? Her voice was cold rather than fierce, yet was there the poison of malice therein. But Birdalone spake: If I be bold, lady, it is because I see that I have come into the House of Death. The dying may well be bold.